Humans are always coming up with new ideas. Whether we're going on a walk, driving to the store, or cooking dinner, our minds have a seemingly endless ability to generate new ideas. But as natural and easy as this process may sometimes feel, it gets tricky when your job depends on it. A content strategist–or any creative for that matter—doesn't have the option to have an "off day." Your content ideas fuel your work. Run out of gas and your content initiatives will stall. Let's dig into several ways you can generate effective content ideas to help fuel your ongoing inbound marketing strategy. There are two different ways you can generate content ideas: 1) by yourself or, 2) with a group. Try each out and see which methods work best for you and your business. Let's start with creating ideas on your own. If you’re looking for a more in-depth process to generating effective ideas, then check out HubSpot Academy’s free Business Blogging Strategy course. What are your buyer personas' reading habits? What are people talking about on forums or question-and-answer sites? 1. What are your buyer personas' reading habits? Put yourself in the shoes of your prospects. Empathize with them. What are their challenges and pain points? What are they searching for online and how do they best consume that content (text, video, visuals, etc.)? Is there a specific site that they visit frequently? Alternatively, if you know which blogs your audience reads, then go to them and see which blogs are the most popular; which posts have the most social engagement? ; what are people saying in the comments field? Another tactic – especially if you're unsure about your personas' reading habits – is to look at your competitors' content strategy efforts. If you share a similar target audience with a competitor, it's likely that the content that performs well on their site will also appeal to your prospects. So look at what they're producing and what's really resonating. Use a site like Buzzsumo to quickly scan their websites and see what's performing well. 3. What are people talking about on forums or question-and-answer sites? Sometimes you might not be able to find out where your audience lives online. That's okay. Another approach to coming up with content generation ideas is to start with a set of topics, such as industry or profession. For example, let's assume your target audience is content marketers. Now go to a site like Quora where anyone can ask a question and get answers from the community. Although anyone can participate, moderators do a great job at limiting noise and keeping quality high. 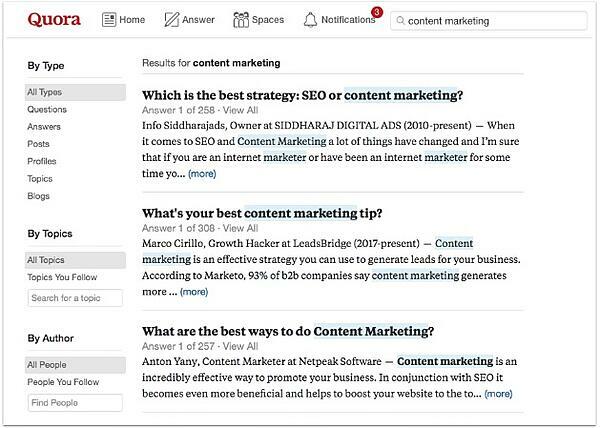 After searching for "content marketing," Quora will return a series of popular questions that contain the keyword, such as, "Which is the best strategy: SEO or Content Marketing?" Without even looking at the answers, this tactic provides valuable insights into common challenges and questions for individuals in that field. 4. What can you learn from Google? 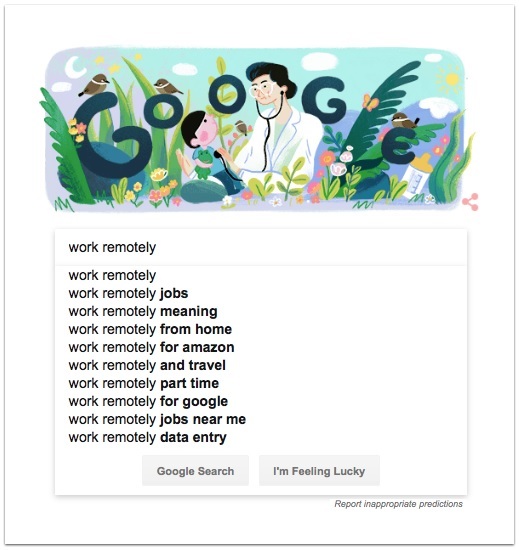 Autocomplete happens when Google suggests a query as you type in the search bar. These “search predictions” might uncover ideas around a topic that you hadn’t thought about. Let's assume you're looking for content ideas working remotely. 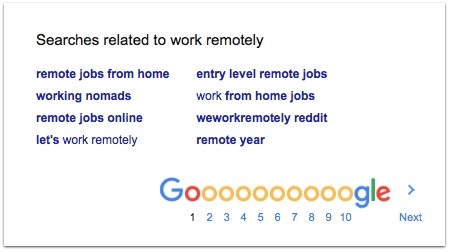 Type in "work remotely," and Google will autocomplete with "work remotely and travel" or "work remotely part-time." And lastly, perform a series of searches based on keywords or topics your buyer persona might use. You can learn a lot from the content that ranks on the first page of Google. How in-depth is the content? Is there an opportunity to expand on a specific point or the entire content as a whole? Is it current? Is there new industry information that can bring value to the content? Is the user experience positive? Is there an opportunity to create something that’s more user-friendly? Is there anything you can learn from the content that you can use to optimize your user experience? 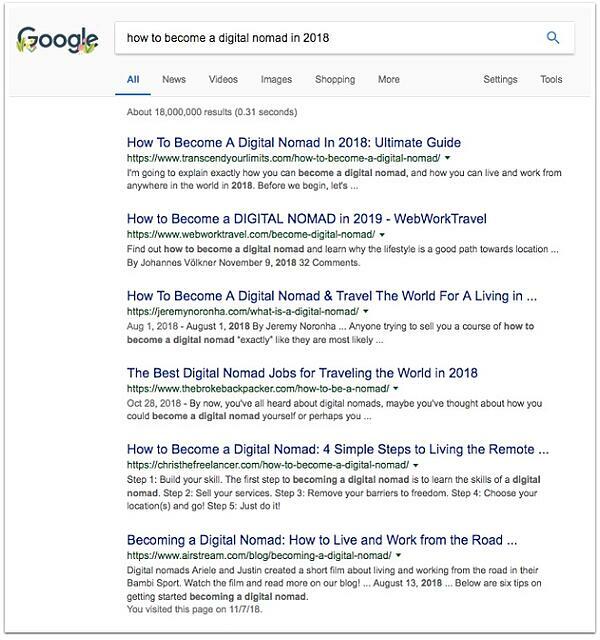 Let’s take a look at the sixth listing: “Becoming a Digital Nomad: How to Live and Work from the Road.” We know right out the gate that this content is educational as it says “how to” in the title. 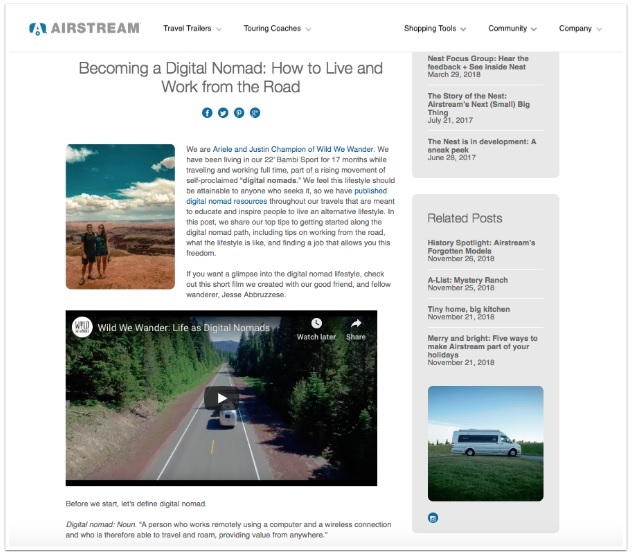 This content is from Airstream, which is an American brand of travel trailers which are easily recognized by the distinctive shape of their rounded and polished aluminum coachwork. Their resource is a great example of content that’s in-depth, up-to-date, and offers a high-quality user experience. 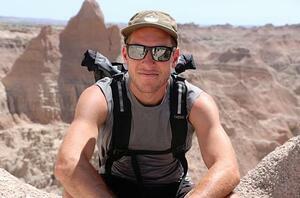 To start, there’s a video near the top of the page showing the digital nomad lifestyle. Adding videos to your content is a great way to engage people, keeping them on your page. And if someone stays on your page, then that’ll reduce bounce rate, which can significantly improve your SEO efforts. 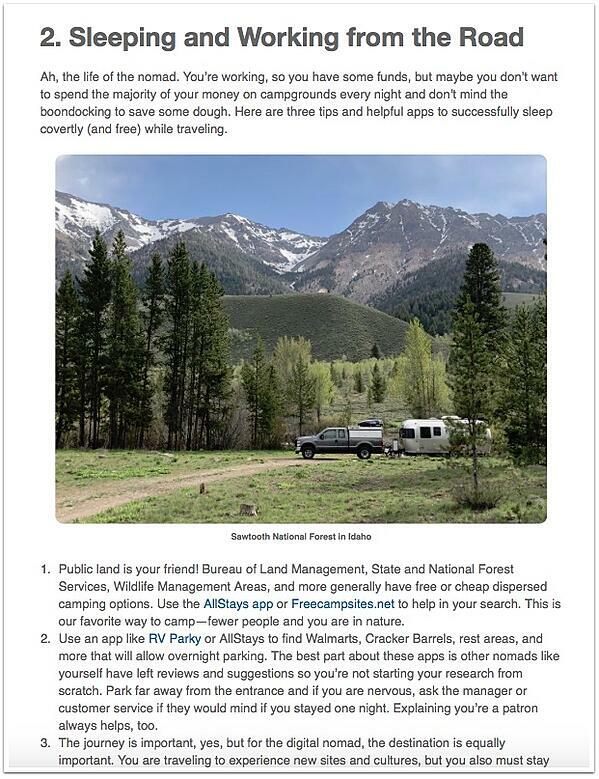 Moving down the page, Airstream’s post offers a sectioned list of educational tips, with bullet points to segment each recommendation. Bullet points are a great way to break up text, making it easier for people to skim your content. But do you see anything that can be improved; somewhere you might be able to provide more value? For example, the blog post talks about several apps to use to find places to sleep. What other apps might you recommend that aren’t mentioned in the article? That could be an angle to explore. Also, don’t stop after reviewing one listing. There’s a SERP with nine other listings just waiting for you to read them. If you see something you like or that gets your creative juices flowing, document it. Don’t expect yourself to remember it later. As you can see, there are many ways to come up with content ideas on your own. But what about leveraging others? A brainstorm can be an incredibly productive way to generate fresh and creative content ideas. By inviting team members who don't spend their day thinking about content, you'll likely get new ideas from a different perspective. First, pick someone to moderate and set a clear agenda. Agenda items could include items like, what's the goal of this brainstorm? ; how long will the session last? ; rules of engagement; and so on. Brainstorms can quickly dissolve into an unproductive group hangout if there's no direction. Make sure someone owns the meeting and that everyone follows his or her guidelines. For example, run through a basic word association game. The first person says a word like, "tree," then the following person mentions another association, like "house" or "cyprus," and on and on until either the first word is mentioned again or a certain amount of time has elapsed. It's amazing what connections people make! This is a great way to get your creative juices flowing! Next, leverage "braindumps." A braindump is an uninterrupted period of time (typically no more than two to three minutes long) when you jot down all the ideas that come to your mind. The goal is quantity, not quality. Don't overthink your answers or wonder how good they are. Just get them on paper as quickly as possible. For example, if you were writing content for a local bed and breakfast, you could suggest a braindump about all the topics that come to mind when you think about specials, things to do in the area, or events. Suggestions might include, "the 15 Best things to do in Asheville, NC" or "Five breweries you have to go to in Asheville, NC." Also, use sticky notes, whiteboards, and other visual aids to keep track of ideas. Sticky notes are especially effective, as it's easy to group them together by topic and identify trends and common themes. Try and display everyone's ideas so the process feels democratic and transparent. You want the experience to be positive so people will want to do it again in the future. You should know that "constraints breed creativity." So make sure to set strict time limits – both for the length of the meeting (no longer than an hour) and the braindumps. You can sometimes let people voice really good ideas after the time is up, but make sure they're exceptions. Finally, remember that the main goal of a brainstorm is to generate new, unexpected ideas. It might not be the time to refine those ideas or critique them. So if all you get out of them is a dozen or so ideas for you to expand and improve upon-that might be enough. And there you have it. Now you have a process to help you generate content ideas that fuel your content strategy.